Have you ever looked at an obstacle in your life – struggling relationships, anxiety, indecisiveness, fear…etc… and concluded the reason your challenge has not moved is that you lack faith? Because we can think if we just have faith as small as a mustard seed, we could move the thick trunk, deep roots and expansive branches of the tree blocking our road. Or at least that’s how I interpreted the famous verse in my early Christian walk. So in my mind, if I had enough faith, God would reveal the end result and a checklist of steps I need to talk to get there, before asking me to move. 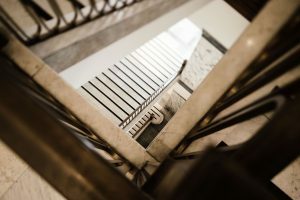 Since I never seem to see the whole staircase, my connection with God must be fuzzy. This hyperbole (exaggeration) IS teaching us we can overcome huge obstacles by faith. But – ready for this – God doesn’t expect us to know the end result BEFORE we command the tree to move. And that doesn’t mean we lack faith. God most often leads His people by giving them only the next right step. It’s how He moves. But I like proof (I’m hard to convince), so let me share some examples of people who didn’t see the whole picture, only the next step. God sends his disciples to cities without any hotel and restaurant reservations. Like, all. the. time. God often works one right decision at a time. For those recovering perfectionists like me, this is HUGE! God doesn’t tell us the whole picture – not because He didn’t see enough faith in us to reveal to His entire plan for our situation to us – IT’S HOW HE WORKS. When I stop and think why we only get a little info at a time, it makes sense. God is pursuing an authentic, daily relationship with us. Just like we have with our loved ones where we achieve connection by talking, hanging out and problem-solving life one step at a time. 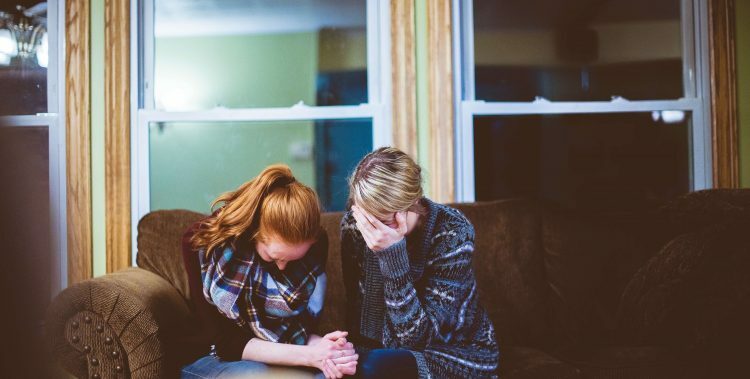 So we pray for wisdom, talk to trusted loved ones, analyze doors opening and closing, get in the word, then – most importantly – we still ourselves before our loving God daily and let Him speak to us from the quiet corner of our hearts. (I think people also call that, “listening to your gut.” They mean God.) Then, we expect to hear from God just the next right step. We can feel nervous, unsure, doubtful; but we know that Jesus is Lord so we command the mulberry tree in our lives to move even though we can’t see the whole staircase. Next, we listen to our heart and put one shaky step forward. …then we take that one too. Before we know it, God has moved that mulberry tree in our life. In God’s creative and mysterious ways of getting us where we need to be, the moving of the obstacle in our lives probably won’t play out like we envisioned. We went around the tree. We climbed the tree, victoriously hopping down on the other side. We dug a hole under the tree. We cut down the tree. We stared the tree down until we knew the best step was to 180 degrees around and walk away from the tree. We began to see the beauty of the tree (shade on a scorching day), peace grew in our hearts and we stayed next to the tree. God moved that mulberry tree by changing our situation or by changing us. So next time, we have a challenge and God doesn’t answer our prayers with a detailed plan leading to his end result – we don’t freak out. We don’t scold ourselves for what we see as lack of faith that led our cell phone connection with God to go through a tunnel and Him to withhold information from us. We remember how God often works. Friends, a whole tree can be moved with a sliver of courage to take the next right step. Let’s stop stressing about the whole staircase and simply look for the next place to put our foot. Cheryl, I enjoyed reading your thought on faith like a mustard seed. What a good idea to just focus on the next step. I always identified with the man who told Jesus he believed, but asked for help with his unbelief. I found you via Essential Things Devotions. What an amazing post. God is so good. I would love for you to post this on my blog today for the link up for others to see too! Beautiful words, Cheryl. I appreciated your insight into the verse about the mulberry tree – thanks for that! I am glad that story is included in scripture. It is encouraging that you don't have to be sure of everything to still have faith. Thanks for the comment. I enjoyed reading your thoughts. 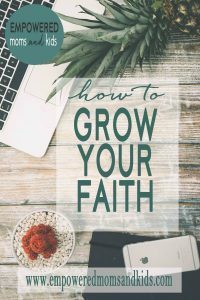 Hebrews 11:1 "Now faith is confidence in what we hope for and assurance about what we do not see"
Thanks for linking up with the Faith and Fellowship blog hop! There are many uncertainties in life, but our faith fully placed in Christ will see us through the hard times. We can trust His Word when he tells us to believe. Perhaps that Mulberry bush is still being uprooted and soon it will be cast into the sea – – don't give up hope. Keep telling it to leave. Our words spoken are powerful and Jesus told us to SAY to the mountain (and bushes too) He has given us the authority to move and work in His Name! You are my neighbor at Spiritual Sundays! Hazel, thanks for encouraging me with your thoughts! Susannah, I love how you described faith! Thanks for letting me link up at your blog! Exactly right. We don't have to know the whole path; we only have to take the next step. Sometimes I'm not comfortable with God working that way, but other times I appreciate the wisdom of God to not require us to know it all! Thanks for sharing this. It's difficult to make peace with uncertainty but it's necessary to faith.